The Darling River, information on the history (Indigenous and European) and river facts of one of Australia's most iconic and longest waters that flows from southeast Queensland to the southwest corner of NSW at the point it joins our other iconic river, the mighty Murray River. One of the most iconic rivers of Australia, the Darling River has always been an integral part of the Indigenous culture, a culture that can be traced back at least 45,000 years, and today the river remains the lifeblood for their living culture. To the indigenous, the river had various names according to the local communities (to the Paakantyi, or Barkindji, it is the Barka) along the river but the European name was assigned it was 'discovered' by explorer Charles Sturt in 1829 who named it in honour of Sir Ralph Darling, the then Governor of New South Wales. The Darling is undoubtedly Australia's most iconic waterway; the Darling River (as named) is a section of a much larger waterway which together forms longest waterway in Australia, dissecting the extensive Murray Darling Basin. The Murray Darling Basin covers around 14% of the land area of Australia and reaches inland to near Broken Hill, north to central Queensland, east and south to the Great Dividing Range. The Darling River is 1,472 km long when measuring it is a named river from the junction of the Culgoa and Barwon rivers between Brewarrina and Bourke. But, if measured as a natural waterway from its source in south-east Queensland (The Condamine River) to the Murray-Darling confluence at Wentworth, it measures 2,739km making it Australia's longest waterway. The Darling River originates between Brewarrina and Bourke where the Culgoa and Barwon rivers meet. The triburaries of these two rivers originate from the from the ranges of southern Queensland (The Darling Downs) and northern New South Wales to the west of the Great Dividing Range. These tributaries include the Balonne River, the Macintyre River. the Gwydir River; the Namoi River; the Castlereagh River; and the Macquarie River. Near Bourke, the Bogan, Warrego River, and Paroo rivers also join the Darling River. What is the gradient of the Darling River? As the surrounding are of the Darling is relatively flat, the average gradient of just 16 mm per kilometre. 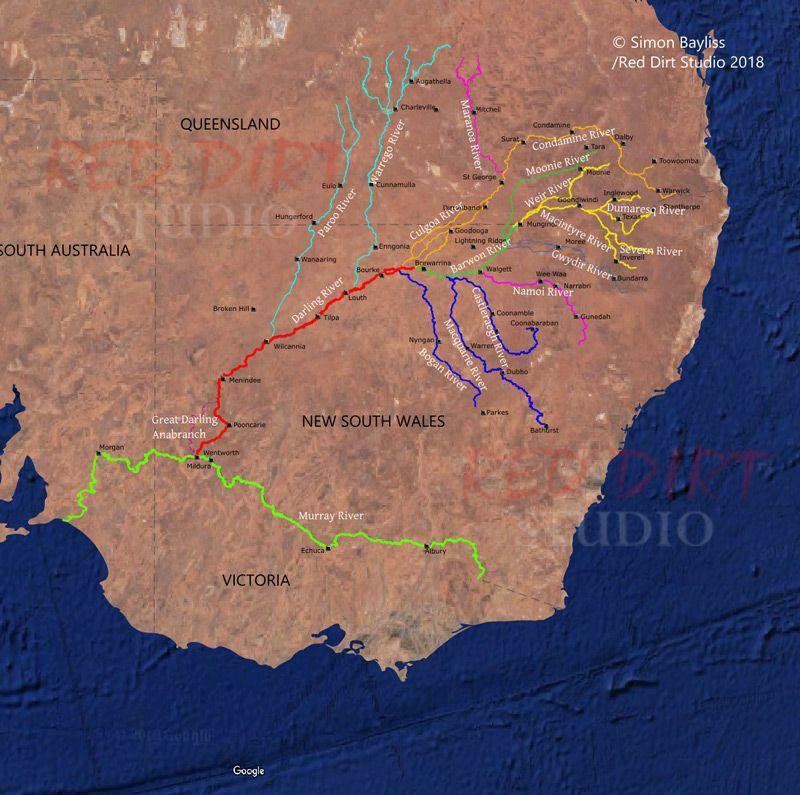 The Darling River system consists of over ten tributaries with the Upper Darling River (Barwon-Darling) being a complex waterway made up of many individually named waterways. The Barwon–Darling covers about 13% of the Murray–Darling Basin, but only accounts for about 2.8% of the flow in the Basin; however much more water flows through the system with 99% of its flow is generated via the upstream catchments. The Paroo, an ephemreral river that only flows in wet years, joins the Darling via a series of waterholes, lakes and wetlands and is the last free-flowing rover in the Murray Darling Basin. Sourcing from the Carnarvon Range in Queensland, the ephemeral Warrego River and flows through flat semi-arid plains with 80% of its catchment in Queesland. One of the largest catchments in the Murray–Darling Basin, the Condamine-Balone catchemnt rivers rise from eleveated areas of the Darling Downs. The Condomine is sourced from the near Mt Superbus in the Main Range National Park near Warwick and becomes the Balonne near Condamine. The Maranoa, a tributary flowing from the Canarvon Gorge, meets the Balonne at Lake Kajarabie (Beardmore Dam) near St George from which the Culgoe River flows southwest to join the Darling River about 20km east of Bourke. With most of it's catchment (98%) in Queensland, the Moonie River flows across south-west Queensland, through a very flat landscape into northern New South Wales. The Moonie is joined by thirteen minor tributaries before merging with the Barwon River, near Mungindi. The Border Rivers is a group of rivers that straddle the New South Wales and Queensland border, with the rivers rising on the western slopes of the Great Dividing Range and running westward, gradually merging with one another to become the Barwon River on the floodplains east of Mungindi; the Barwon River flows past Walgett and Brewarrina before joining the Culgoa to become the Darling east of Bourke. The major rivers that make up the Border Rivers are: Macintyre River, Dumaresq River and Severn River, with the Moonie River from the Downs joining the Macintyre River near Collarenebri. Stretching westward from the Great Dividing Range, thr Namoi River flows to the floodplains of northern New South Wales via a diverse range of climtes and landscapes ranging from cool, high rainfall areas in the rugged terrain in the east, to semi-arid, low rainfall areas on riverine plains in the west. Joining the Barwon River between Walgett and Brewarrina, The Macquarie–Castlereagh system (the Castlereagh, the Macquarie and Bogan rivers). The Macquarie River rises in the Great Dividing Range near Bathurst and flows north-west through foothills and slopes past Wellington and towards Dubbo. The Castlereagh River rises in the volcanic remnants that shape the Warrumbungle Ranges, west of Coonabarabran in northern New South Wales. Just before the Macquarie River meets the Barwon River, the Castlereagh River joins the Macquarie River. The Bogan River rises in the Harvey Ranges near Parkes, in central-west New South Wales, and flows north-west past Nyngan to meet the Barwon River upstream of Bourke. The Darling River, and its tributaries, is such an iconic and extensive area that attracts travellers in all forms of SUVs and RVs from all around Australia.